Paddy Barnes during his bantamweight bout against Oscar Mojica at the Madison Square Garden Theater in New York, USA. Photo by Mikey Williams/Top Rank/Sportsfile. 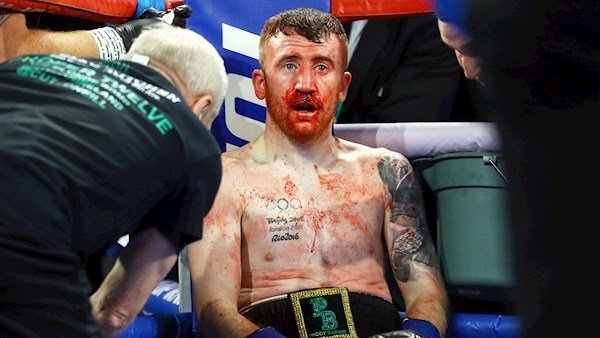 Paddy Barnes is considering calling time on his boxing career following a shock defeat by Texan Oscar Mojica in Madison Square Garden’s Hulu Theatre on Sunday. Two-time Olympic bronze medallist Barnes was looking to bounce back from a world title defeat at flyweight last August, jumping two weight divisions to bantamweight, but never looked comfortable after suffering a broken nose in the opening few seconds of the fight. “I will probably retire now because I don’t know… there’s no real point in boxing at all after a defeat like that,” said a brutally honest Barnes afterward. “I think the first right hand he hit it broke my nose, I could hardly see out of my left eye,” he added. Despite a gallant effort, the Belfast man went down by a split decision in the six-round contest, unable to match the Texan’s superior strength and reach. There was better luck on the St Patrick’s Day card for Michael Conlan who dispatched Mexico’s Ruben Garcia Hernandez by unanimous decision, all three judges scoring the 10-rounder 100–90 in favour of Conlan. The 2012 Olympic bronze medalist immediately called out his Rio 2016 conqueror Vladimir Nikitin following the comprehensive victory. Retaining his WBO intercontinental featherweight strap, Conlan stretched his unbeaten run to 11 professional bouts as he steadily makes his way up the ranks towards world title clashes. 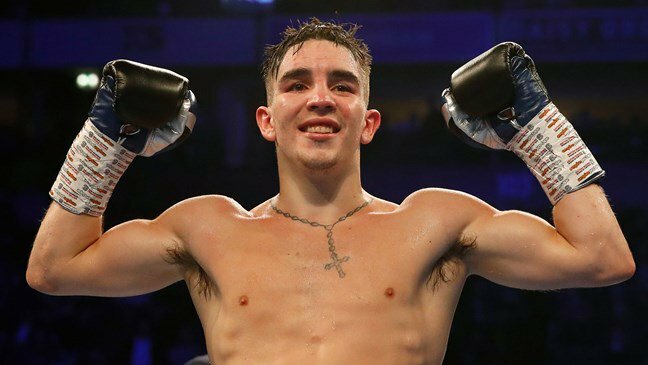 It was the third year in a row Conlan has headlined a Top Rank promoted St Patrick’s weekend event at the New York venue. Irish fighters served up a feast of boxing action on America’s east coast over the weekend. Following Katie Taylor’s WBO win in Philadelphia on Friday, Cork’s Gary ‘Spike’ O’Sullivan stopped Massachusetts Khiary Gray in Boston on Saturday in O’Sullivan’s second comeback fight since his WBA middleweight world title final eliminator loss to David Lemieux last September. The Mahon fighter, who has dropped to light middleweight, eventually wore his opponent down with some hard-hitting body shots. A clash of heads left Gray with a nasty cut over his left eye but by the end of round six both sides of his face were dripping in blood and the ref called a halt to the action. Fellow Leesider Noely Murphy also notched a win on as he defeated John Joyce by unanimous decision. Earlier in the night, heavyweight Gorey Garda Niall ‘Bas’ Kennedy barely broke a sweat as he easily brushed aside former cruiserweight title challenger Matt Marrone in the first round. Very disappointing that Michael Conlon does not follow the lead of many previous boxing and sporting heroes so that people can support him across the divide. Disgraceful that he has no regard for the victims of IRA terrorism. “The sport of boxing has done so much to break down barriers, cross the divide and unite people from all backgrounds in Northern Ireland. “It’s deeply regrettable Michael Conlon doesn’t respect or understand this. This article first appeared in the Irish Examiner on March 19th, 2019. To view the original version, click here.